For the months of August & September. 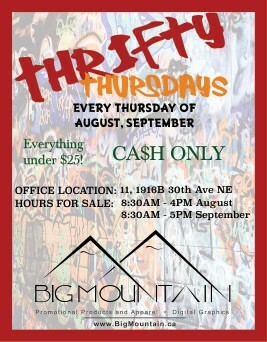 Big Mountain will be discounting everything in the showroom for everything under $25.00. We have Jackets, Sweaters, T shirts, Accessories, Etc. Feel free to come and take a look at what we have to offer. Most of all these haven't been worn and still have tags on them. Great Deals ! for Great Quality! Big Mountain Active Wear Inc.